Create a fun learning experience for your young homeschool student with activities that develop age-appropriate skills. Each lesson corresponds to the daily Bible Story Reader selection and includes four worksheets, as well as an additional worksheet in the Student Workbook Companion. Through a developmental sequence of skills, the 40 lessons cover counting, tracing, matching, and sequencing, as well as recognizing letters, numbers, shapes, colors, and more. Create a fun learning experience for your three-year-old with activities that develop age-appropriate skills. 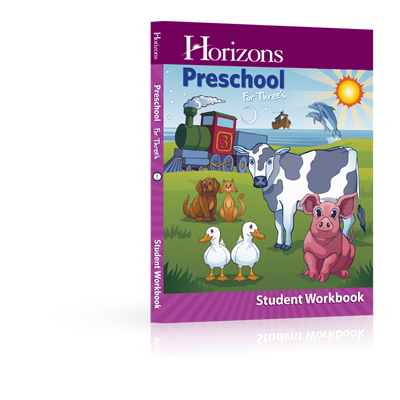 Each lesson corresponds to the daily Bible Story Reader selection and includes four worksheets, as well as an additional worksheet in the Student Workbook Companion. Through a developmental sequence of skills, the 40 lessons cover counting, tracing, matching, and sequencing, as well as recognizing letters, numbers, shapes, colors, and more. Expectations for what students can accomplish on each of the worksheets should match their abilities, which will vary greatly at this age. Some will be able to write, trace, and color, while others will develop these motor skills as they advance in the course. Some matching activities may need to be completed orally, and successful tracing may require the teacher to draw dotted lines. Some students will be able to use pencils, but crayons will work best for most. Handwriting activities are included for practice but not necessarily mastery. Allowing students to trace letters with their fingers and guiding their hands through letter formations is perfectly acceptable in this workbook from Alpha Omega Publications.